Integrated Shield Plans affords patients higher tier hospital wards but what do you need to consider when getting one? MediShield Life is a basic health insurance plan administered by the Central Provident Fund (CPF) to help pay for hospital bills. 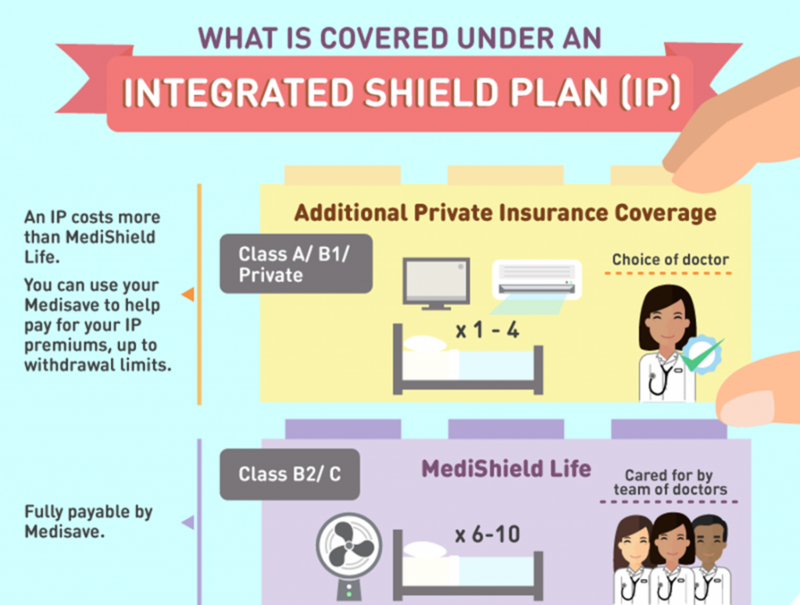 Consumers can also opt to get Integrated Shield Plans (IP), comprising Medishield Life, and an second layer providing additional private insurance coverage for higher class wards in public and private hospitals via a rider. 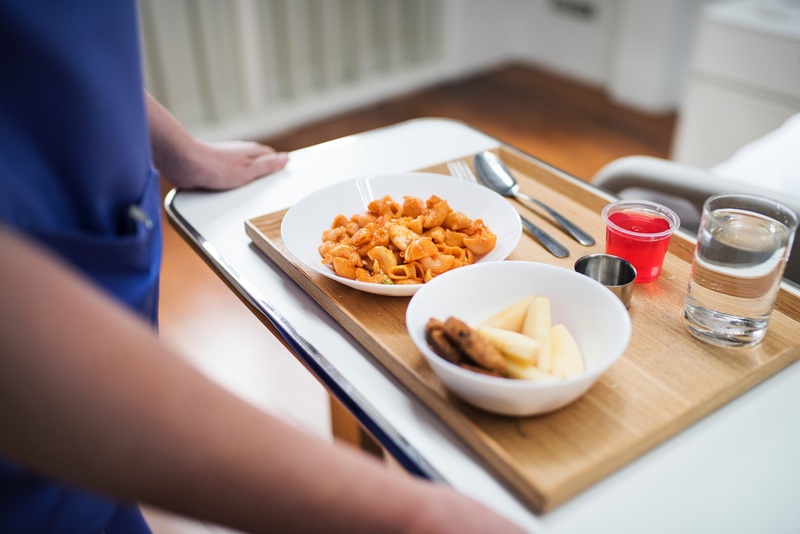 Private hospital wards and even higher class wards at public hospitals can be quite pricey, and as such Integrated Shield Plans are very popular amongst Singaporeans – with 68% of Singaporeans having an Integrated Shield Plan. Of course, Integrated Shield Plans require higher premiums for the additional benefits they provide, so careful thought, on affordability and coverage, needs to be put in before anyone buys such a rider. In this article, we list four things to consider before getting an Integrated Shield Plan. MediShield Life provides basic coverage to take care of large hospital bills in B2 or C class wards at public hospitals. In B2 or C class wards in public hospitals, you share a room with 6 and 8-10 beds respectively, without any TVs. These wards have natural ventilation (no air-con), and the patients are taken care of by a team of doctors. In A/B1 class wards in public hospitals and wards in private hospitals, you get your own bed or share with less patients. The wards are air-conditioned and you’d be in the care of individual doctors. One of the things to consider before getting an integrated shield plan – your personal preference. Figure adapted from CPF website. As the diagram above shows, there is a difference between B2/C and A/B1/private wards. However, it really depends on your personal preference. You can opt for B2/C wards if you do not mind sharing the ward and a lack of TV – a pair of earphones and a good book solves these issues. On top of that, you’d be spending most of your time recovering and sleeping anyways. It is important to consider not just your current budget, but your future budget as well as premiums of shield plans as it will increase as you get older. The increases are not trivial as you age. To illustrate this, we compiled integrated shield plan premiums for private hospital from the six insurance companies that offer them. In addition, if you are curious to know more, you can either go to the individual companies’ website or the Ministry of Health’s website. The Ministry of Health releases regularly updated information on MediShield and Integrated Shield Plans, including premiums and benefits. A bar chart showing the increasing premiums for private hospital plans. Plans referred to: 1) Income Enhanced IncomeShield Preferred, 2) AIA HealthShield Gold Max A, 3) AXA Shield Plan A, 4) Great Eastern Supreme Health P Plus, 5) Aviva MyShield Plan 1, 6) Prudential PruShield A Premier. Some of the plans do not have information at certain age ranges. As the illustration shows, the premiums increase over time, and most sharply after age 40. More specifically, the premiums increase between 50-70% when you are 41, depending on the company we bought from. While we used private hospital shield plan premiums to illustrate this, the pattern is the generally same for most other plans. Your future ability to pay the ever-increasing premiums is important because there is a limit on how much you can draw from your MediSave to cover the premiums, which means you’ll need to fork out cash for the rest. The ability to pay is one of the more important things to consider before getting an Integrated Shield Plan. As the name suggests, riders are add-ons to enhance existing coverage by the Integrated Shield Plans. These riders are useful, as they can assist in reducing any deductible or co-insurance portions on the consumers’ hospital bills (subject to co-payment within limits). In addition, there are two ways to get daily cash benefits using riders. One way is to be warded in a ward that is of a lower class than you were entitled to. Another way is to get daily cash benefits are riders that specifically pay out daily cash benefits for every day you are hospitalized. Other riders include coverage for children’s illnesses and international hospitalization. Besides knowing your coverage, we feel that it is important to understand the average bill sizes across different hospitals and wards. We visited the Ministry of Health website, which displays the rates for various hospitals in 2015. In the list, there are nine hospitals – Alexandra Hospital (AH), Changi General Hospital (CGH), Khoo Teck Puat Hospital (KTPH), KK Women’s and Children’s Hospital (KKH), National University Hospital (NUH), Ng Teng Fong General Hospital (NTFGH), Singapore General Hospital (SGH), Tan Tock Seng Hospital (TTSH), and National Heart Center (NHC). A comparison of average bill sizes from different hospitals. Source from Ministry of Health website. Unsurprisingly, the average bill sizes vary across different hospitals. 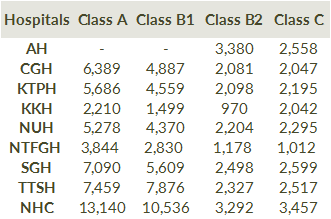 While there is little difference between the average bill sizes between Class B2 and Class C, the difference is much more noticeable for between Class B1 and Class B2. Note that the bill sizes are on average, and do not reflect the bill for various medical conditions. For that, it is another major article topic in itself. We hope that this article was useful in sharing the things to consider before getting an Integrated Shield Plan. It can be tricky to figure out the kind of coverage you need. As such, if you have any more questions on Integrated Shield Plans, why not ask fundMyLife’s curated pool of trusted financial advisers? We Ask Financial Advisers: What Are The Common Misconceptions About Integrated Shield Plans?